Would you like to take a handsome fella like me home? 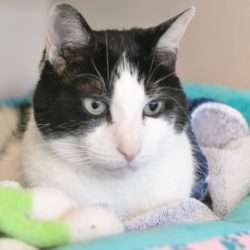 I was brought to the MCSPCA after my owner was no longer able to care for me. A nice boy like me hopefully won’t have long to wait before my new family finds me! I am 12 years young and in need of a home to start spending my golden years in. I might seem a little shy at first, but after you spend some time with me, you’ll see what a sweet boy I am! I need a quiet home where I’ll get lots of love, room to play, and some cozy spots to rest – maybe right next to you on the couch! I haven’t lived with other cats before, but I could try if they are very mellow and friendly like me. I wouldn’t mind being your only kitty either! Would you like to bring home a gentle boy and add me to the family?